"Make an Impact with your very own personalized neck tie. 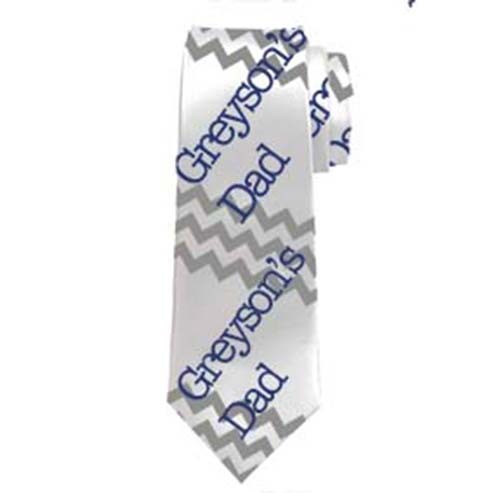 This is a great looking tie that can be completely designed by you! These neck ties make great Father's Day, Christmas, or birthday gifts! Impress your friends with a brand new tie designed by you! Our unique decoration process actually infuses your photos into the fibers of this stunning necktie so you get a DURABLE and Vibrant photo necktie! Great for special occasions, teams, and attention-getting. Great for a unique dress piece or a tacky gag gift! They are made from a white poly-satin material and have a little bit of a satin sheen to them. Again, perfect for special events, dealer incentives, sales rewards, executive gifts, Fathers Day, and more. They can be fully decorated and make a perfect one off unique gift. Put pictures of the kids, step and repeat a family crest or other fun ways to decorate this blank canvas."